Beetle Cabinet - 19 plate etching. The second drawer shows the stages of an etching and I displayed this, pinned, echoing the style of an entomologist. Next are multiple etchings printed using two plates inspired by the patterns found on beetles and leaves from my pond. There is also a drawing taken from Darwin's beetle box, which started this whole project and various beetle and wing inspired etchings. I also included a group of very small paintings that I called Specimen Paintings and some of the entomology boxes which I painted, with etchings of beetles inside. As mentioned, Darwin's beetle box originally seen at the Zoology Museum in Cambridge inspired this installation and I created my own beetle box full of etchings of beetles. The antique box had a photopolymer print from a photograph that I had taken of the water at Wicken Fen in the lid of the box and underneath the pinned beetle etchings. 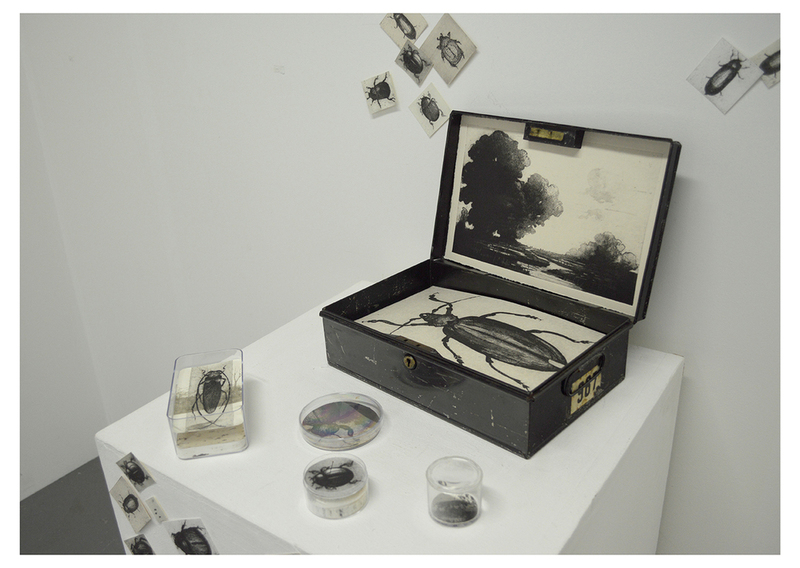 The large beetle in the black antique deed box seemed to lend itself to an etching of a large beetle. In the lid of this deed box is an etching of a classical landscape. 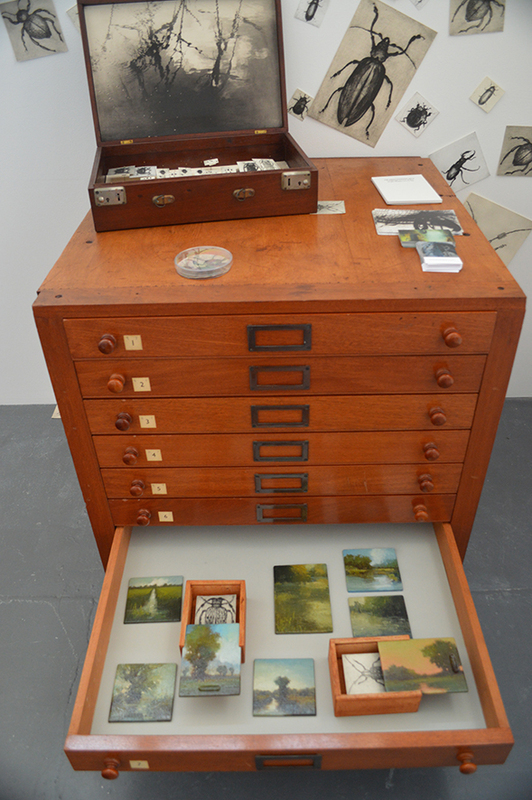 I used an antique wooden watchmakers cabinet to add to this concept of compartmentalisation and collecting by placing beetle and nature inspired etchings and photopolymer etchings into the small squares. Being fascinated by my Father's pond, I developed some drawings from photographs taken of the rose petals which had fallen into the pond and deteriorated. From these drawings I made photopolymer plates to fit into a small slide box and on the lid I painted a landscape. On top of the prints I placed tiny etchings of pond insects. This body of work reflects my conflicted feelings inspired by the Victorian obsession with science and nature and their desire to harness and categorise it. Elements of capture and release whilst simultaneously enjoying the opportunity to observe in great detail have informed this body of work. I have played with scale, employing various intaglio techniques to create an installation of beetles escaping from their entomological cases back to the environment, whilst simultaneously playing with microscopic elements which would not be possible without their capture. If you have any more questions regarding this installation, please feel free to contact me via my contact page.